Ugh… Germs on Soap… Really? Since germs seem to live on almost every surface, it should come as no surprise that they are even found on soap. While it is nasty to think about, they are unlikely to make you sick or cause infections on your skin. Most people who are relatively healthy should be able to fend these germs off without much trouble. However, people with weakened or compromised immune systems may find it best to stick with liquid soap. A study, performed 2006 and reported in Outside magazine, cited public use of bar soap as a continued source of reinfection in dental clinics. This is perhaps because the soap was unlikely to completely dry between uses. Not to mention, in soap containers that hold moisture in the bottom, you are likely to get an accumulation of yeast, fungi and bacteria. So, even though bacteria is present on the slippery soap surface, there are things you can do to minimize its risk to you. First of all, make a point to rinse the bar of soap off under running water before using it. Then, lather up your hands to wash away germy slime. Also, allowing the bar of soap to completely dry between uses instead of remaining moist will deter further germ growth. Thankfully, if the soap in question is only shared with your family, then you probably have the same microorganisms anyway. Nowadays, most public bathrooms only offer liquid or foam versions of soap. However, if you do find yourself faced with only a bar soap option, rinse it off before using it. Follow up with rinsing your hands very well. Wash them for at least 30 seconds on both sides, up to the wrists, down to the fingertips and beneath nails. While there may be some risk to bacterial transmission from the surface of bar soap, whether or not you use it is more likely to be about personal choice. Organic bar soaps are great if you make sure to rinse and dry them properly, and a pump of pure liquid castille soap works great too. No matter which you choose, just bear in mind that washing your hands thoroughly is the most important factor. 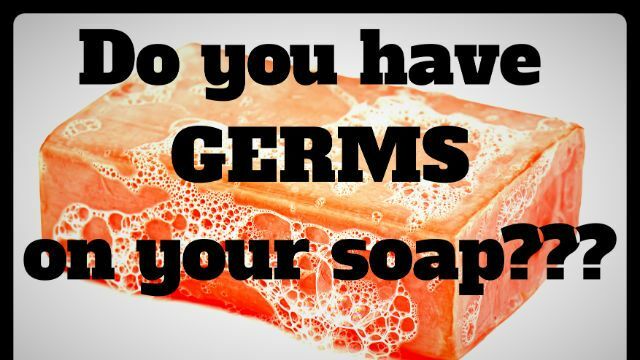 Hey Buddy!, I found this information for you: "Ugh… Germs on Soap… Really?". 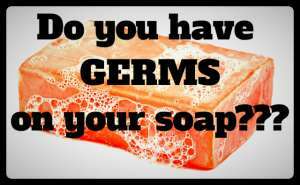 Here is the website link: https://www.thealternativedaily.com/ugh-germs-soap-really/. Thank you.